We live in the information age; consumers are empowered with detailed, rich databases to help them pick out the precise service or product that they want. Often the problem is more sifting through the data rather than having access to it. One example of how information is readily available is for airline tickets and flights: many customers are price sensitive, that is they are seeking the cheapest options available. However, thanks to modern information management systems, customers are also able to narrow down their searches to include additional information such as the availability of at-seat power or onboard WiFi. And now, thanks to a tie up between Google and industry-leading flight information provider Routehappy, customers across the world will soon have an easier way to help them differentiate between the different options available thanks to Google Flights. Flights is set to include access to Routehappy's rich information service that may tell them the services available onboard. Because of the way Google's Flights data is generated at the Google server side, the upgrade to Flights can be quickly and easily rolled out. Flights' information will be linked in from Routehappy's two airline ticket information services. These two database systems are Flightpad and Flightmatch. Flightpad in the first instance is built from data is derived from hundreds of different disparate sources and is used by Routehappy to generate information on billions of possible flight combinations. However, information by itself is meaningless and here is where Routehappy employ Flightmatch, which the company described as "a set of powerful and intelligent algorithms that dynamically match and score Happiness Factors, duration, and ratings for billions of possible flight combinations." Gianna Marostica, Director Business Development, Travel, Google, said this on the matter: "We know people are looking for more information about the flights they're taking before they buy, so integrating Routehappy Happiness Factors is a great addition to Google Flights. Now even more people have access to comprehensive flight amenity data and useful flight search information." 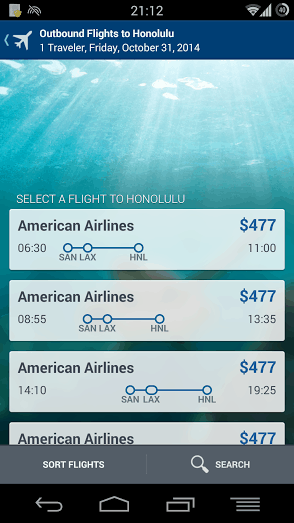 Robert Albert, Routehappy's Chief Executive Officer, added, "Google Flights is innovating flight search in powerful new ways, including offering lightning fast search and now more comprehensive amenity data for flyers. We're thrilled to be partnering with Google in bringing useful information to flyers everywhere." Routehappy have recently announced data licensing partnerships with Expedia and Serko. Are you an occasional airline customer, or are you a frequent flyer? How significant are the onboard facilities? Does the thought of a long haul flight without onboard WiFi give you nightmares in the middle of the night? Or are you complete focused on low fares? Let us know in the comments below.